Seychelles President James Michel announced today during his State of the Nation Address in the National Assembly that Seychelles’ efforts to combine marine conservation and liability management objectives through an innovative structure received a major boost last night when it secured a landmark debt buyback agreement with the Paris Club and South Africa, during a meeting in Paris. President Michel welcomed the agreement of the Paris Club with Seychelles’ proposal as a historic and decisive moment in finding practical, market-based solutions to tackle climate change and support the Blue Economy. “Our Blue Economy message is being realised through innovation and concrete action to reduce our vulnerability. Last night, Seychelles has once again created history. Our proposal for a partial exchange of our debt in return for financing action to mitigate against climate change has been accepted by the Paris Club. This means that about US$30M of our debt will be transferred in terms of a fund for the protection and development of our marine space – our Blue Economy. In addition, our partners are giving us a further 5% reduction in that debt. Through this debt exchange, we shall be better able to protect our oceans, create opportunities for artisanal fishing, reduce our foreign exchange payments, and keep more money within our economy,” said the President during the State of the Nation Address. President Michel thanked all of Seychelles’ partners and creditors who made the agreement possible, and who showed their confidence in the country. The unprecedented agreement means that Seychelles will become only the third country to buy back its Paris Club claims at below par through its market-based window, and the first to do so with funds provided by third parties. The agreed transaction will enable Seychelles to buy back over 90% of the debt maturities falling due to the Paris Club between 2015 and 2021 at a discount to face value. This represents the highest rate of creditor participation ever achieved in a market-based debt buyback transaction involving Paris Club debt. In a second phase of the operation being pursued by the Government, the debt to be bought back from the Paris Club and South Africa will be converted into new Government of Seychelles debt obligations to be issued to the Seychelles Conservation and Climate Adaptation Trust (SCCAT) – the local trust created to fund and manage an ambitious marine conservation and climate adaptation initiative that seeks to ensure a sustainable development of the ‘Blue Economy’ on which the future well-being of the Seychellois population depends. The environmental initiative – which has been designed in conjunction with The Nature Conservancy, a US-based environmental NGO – is an integral part of the Government’s strategy to reduce the country’s overall levels of vulnerability and further increase its resilience. As a single operation, the agreed debt buyback and subsequent debt-for-climate change adaptation swap marks a world-first. Seychelles’ fiscal and external accounts will also benefit indirectly from the operation through an effective lengthening of debt maturities and a conversion of a portion of debt currently denominated in foreign currency, into debt denominated in local currency. He said the Seychelles example can spur new momentum towards real action on climate change at the Paris COP later this year. Minister Adam was accompanied during the negotiations by Mr. Pierre Laporte, former Minister of Finance, Trade, and Investment in his capacity as an Advisor, having led the negotiations with the Paris Club prior to this concluding round, Mr. Brian Charlette, the Director for Public of Public Debt at the Ministry of Finance, Ambassador Bernard Shamlaye, and the Government’s financial advisors, Mr. Sebastian Espinosa and Mr. David Nagoski from White Oak Advisory. 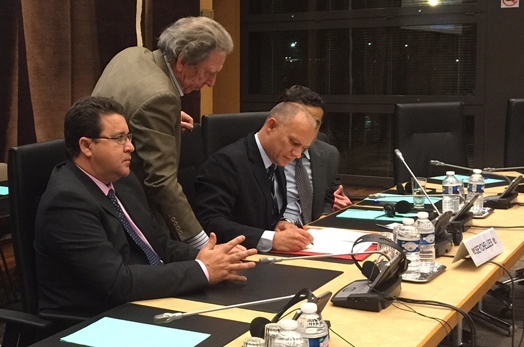 Photo caption: Minister Adam signs agreement on behalf of the Government of Seychelles.